All Things Dog Blog All Things Dog Blog: More Fun with Bo! Our full day of fun with Bo Obama here in the Florida sun will include a healthy breakfast followed by some poolside fun. Tanner's plan is to demonstrate and then teach the art of Fetch in its truest form. He takes his fetch games very seriously, so I'm hopeful he'll be patient as we acclimate Bo to Tanner's favorite game. The Secret Service has put the nitch on our plan to photograph this visit. I guess they are short-staffed and need us to keep Bo's activities under wraps. When we heard this, we ran right over to Home Goods and snagged a camouflage wetsuit, perfect for making sure no passersby recognize Bo. The goal is to keep the Pupparazzi off our trail, so Oliver and Tanner have been taking turns as lookouts. My task will be to offer swimming instruction. Since Bo is a Portuguese Water Dog this shouldn't be too difficult, but we're not sure how much action he's seen in the pool, so safety first. We've got a life vest if he's wary, so we're well-prepared. Tanner even offered to try on the camouflage wetsuit and sure enough, it's a snug fit on my boy which probably means we're in the ballpark for it fitting Bo. I think we're ready for Bo's fun day on the water. After swimming instruction is complete, we'll give Bo a soothing bath with some yummy smelling shampoo we picked up at Home Goods, then towel him off with this adorable microfiber towel. Next up? Naptime. Tanner and Bo will be pooped from swimming and all that Fetch instruction. I'm sure Tanner will do his share of showing off. He is, after all, a Fetch master! We'll assign Oliver to guard duty during their nap. He can use the computer-monitored video surveillance for extra security. Oliver has been busy researching a companion for Bo. Being a 'companion dog', Oliver knows how important it is for Bo to have somepuppy to hang with. What's the poor fella to do when Sasha and Malia are off to school or Camp David with the rents. He needs a buddy, for sure! 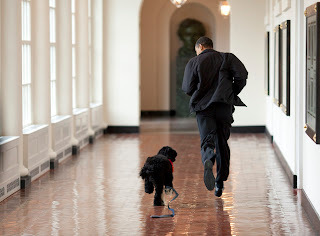 Off They Go Without Bo! This worry brought Oliver to the decision to seek out a companion for Bo. Oliver worked over Petfinder.com quite thoroughly, checking out areas located near DC. 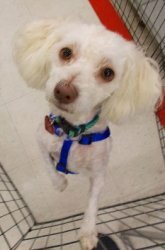 Knowing that he needed to locate a reasonably reduced-allergen dog (like Bo's breed or a poodle) he selected a Toy Poodle just outside DC in Bethesda, Maryland. I'm embarrassed to say that her name is Carrie. Yes; you read that correctly. I guess it will help me remember her name! Carrie is a 12 lb. little lady, about 1 year old. Petfinder's description says "Some dogs seem like they have read "Miss Manners" in their spare time. We know Carrie can't read, but she does seem ladylike and focused. . ."
Appropriately small toys, a girlish bed in the furry family's favorite Black and White is a perfect balance for Bo's bed and his party colors. We now have a totally coordinated furry Furst Family, thanks to some help from Coco, the Home Goods pet products advisor. Now that the Obamas may have a girl dog, we had to make sure a few girlish items were ready to go, while still leaving the selection of fashion to the Obama daughters who will, no doubt, enjoy dressing up Carrie to show her off. We found special shampoo for girl dogs at Home Goods and pink bags for picking up ladylike deposits on the White House grounds. With an appropriately sized collar and matching leash, this girl will be just about ready to rock. Are you ready Bo? Apparently he and the President are in training for a younger pack member. We'll be sharing some tips in the coming weeks on integrating a new pup into your family, as well as moving a dog. Watch for these helpful hints that we'll be sharing to assist Bo and his family with a possible adoption. And of course, Home Goods will be happy to help with all the necessary supplies needed for a new adoptive brother or sister for Bo. I love reading about Tanner and Oliver. I really need to go to HomeGoods for Lulu. I keep forgetting about it.